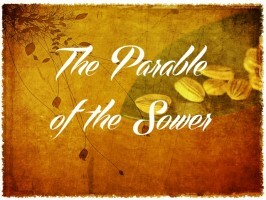 This parable “breaks the mould.” It is different from most of the others. In this parable, Jesus tells us to understand all the details as representing real characters and the response that people have to His message. The mistake many have made is in taking the way they interpret this parable and making it a pattern for interpreting all the other parables. Can you think of times in your own life when the message of Jesus did not produce in you the harvest that it could have? Today, where is the seed falling in your life? Refer to your Prayer Journal.